I am so happy to be able to review this. I love IT Cosmetics products. Lately they have been killing it in the foundation department. They come up with foundation that is absolutely amazing. This one is no exception. Using this requires using only a tiny amount. As mentioned, it is full coverage. You only need one to two pumps to do your entire face. Mainly one and a half would work. It really covers incredibly well. I used two pumps and found myself with extra product. The SPF is a mineral sunscreen, which is great for those who are allergic to chemical sunscreens. It contains titanium dioxide 9% and zinc oxide 6.3%. Also it comes in so many shades. It comes in 12 shades. I use Fair, the lightest shade. It also comes in: Fair Light, Light, Light Medium, Medium, Neutral Medium, Medium Tan, Neutral Tan, Tan, Rich, Rich Honey and Deep. Medium is the most popular color. I apply mine with a Beautyblender sponge that is damp and start from the middle of the face working outward. I fine that the Fair shade works very well and you can tell that it gives you a beautiful glow to the skin. Even after using a little bit of powder to set it, the glow remains. It is a great product and I LOVE the results I get when using it. I just love the glow it gives the face. Skin looks practically perfect and looks beautiful. This product is amazing. Skin looks as smooth as porcelain yet can breathe and doesn't feel as if it has foundation on it, the product is so light. I would recommend this for mature skin, dry skin, normal skin and combination skin. If you have oily or acneic skin then I do not think this product would work well for you. 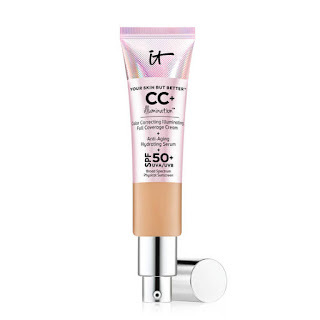 IT Cosmetics Your Skin But Better CC+ Illumination with SPF50+ is available from www.itcosmetics.com, www.ulta.com, www.sephora.com, www.qvc.com and in Ulta stores. 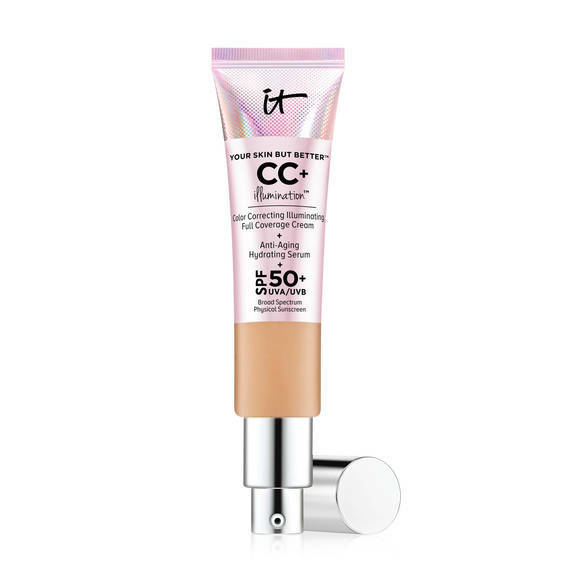 Like IT Cosmetics on Facebook:https://www.facebook.com/itcosmetics; Follow IT Cosmetics on Twitter:@itcosmetics; Follow IT Cosmetics on Snapchat:https://www.snapchat.com/add/it_cosmetics; Follow IT Cosmetics on Pinterest:http://www.pinterest.com/itcosmetics/; Follow IT Cosmetics on Instagram:https://www.instagram.com/itcosmetics/ and Subscribe to IT Cosmetics on YouTube: https://www.youtube.com/user/itcosmetics.